Our Polyurethane Armor is the Highest Quality LARP Armor available on the market today! Featured in movies like (A Knights Tale) and (Timeline), this armor is made from Tough Polyurethane. The armor looks like REAL Medieval and Renaissance Armor but will not rust, dent or corrode. These pieces of Polyurethane armor are the Very Same pieces professional actors and stuntmen use in major motion pictures. The armor can also be used by individuals for LARP events, Stage, Faire and Medieval Re-enactments. These Hand Made items take 6-12 weeks construction time. Polyurethane Arm Armor made from tough Polyurethane that will not rust, dent or corrode. Including spaulders, full arms, vambraces, arm bracers, Elven Bracers and gauntlets. 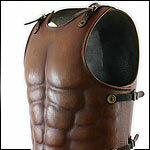 Breastplates and Body Armor made from tough Polyurethane that will not rust, dent or corrode. Including Medieval, Renaissance and Gothic Breast and Back plates, and Elven Armor, and Muscle Breastplates! Polyurethane Leg Armor for LARP made from tough Polyurethane that will not rust, dent or corrode. Including three quarter legs, various greaves, leather look and Elven greaves!